In an interview with NBC News, Russian lawyer Natalia Veselnitskaya, who met privately with President Trump's eldest son Donald Trump Jr. in January, denied having ever worked for the Russian government or having access to any damaging information on Hillary Clinton. "I never had any damaging or sensitive information about Hillary Clinton. It was never my intention to have that," Veselnitskaya said. And she told the Associated Press in an interview that her meeting with him had nothing to do with his father's presidential candidacy. "I met him in a private setting," she said. "It was a private meeting not connected to the fact that he is the son of the future or current (presidential) candidate. Excuse my indifference to politics, I don't know if Trump was a candidate by then, the only candidate of the Republicans, or not. It was absolutely not interesting to me. I'm not interested in politics." At the time of their meeting, Mr. Trump had just clinched the Republican nomination. When asked point blank by NBC if she had any connections to the Russian government or had previously worked for the Kremlin, Veselnitskaya replied, "No." Her denial comes amid reports that the man who set up the meeting last year, which also included Mr. Trump's son-in-law Jared Kushner, and former Trump campaign manager Paul Manafort, had indicated in an email to Trump Jr. that the Russian government was the source of the sensitive material. "I never knew who else would be attending the meeting. All I knew that Mr. Donald Trump Jr. was willing to meet with me," Veselnitskaya told NBC News through a translator. She added, "I could recognize the young gentleman who was only present in the meeting for probably the first seven to ten minutes. And then, he stood up and left the room. It was Mr. Jared Kushner, and he never came back, by the way." The lawyer went on to describe Manafort as "always looking at his phone" during the meeting, adding that he "never took any active part in the conversation." When pressed on just how Trump Jr., Kushner and Manafort might have been under the impression they were going to be told damning information about the Democratic National Committee and Clinton, Veselnistkaya said, "It's quite possible that they had a desire to hear this information, so from what I'd been telling them that's what they heard. What interested them. I was interested in something else." Trump Jr's new lawyer, Alan Futerfas released a statement saying that the email Trump Jr. had received from music publicist Rob Goldstone "suggested that people had information concerning alleged wrongdoing by the Democratic Party front runner, Hillary Clinton, in her dealings with Russia." Goldstone said Veselnitskaya had stated she had information about purported illegal campaign contributions to the DNC that she thought Trump Jr. might find helpful. Futerfas said his client's "takeaway from this communication was that someone had information potentially helpful to the campaign and it was coming from someone he knew" but that Trump Jr. had no knowledge of what they were going to discuss, calling the meeting "much ado about nothing." This came just one day after Trump Jr. acknowledged on Twitter that he took the meeting to learn about information pertaining to Clinton, tweeting Monday, "Obviously I'm the first person on a campaign to ever take a meeting to hear info about an opponent...went nowhere but had to listen." Trump Jr. had initially described it as a "short introductory meeting" and later confirmed to CBS News on Sunday he was asked by an "acquaintance I knew from the 2013 Miss Universe pageant" for a meeting with someone who might have "information helpful to the campaign." He said Veselnitskaya made statements that were "vague, ambiguous and made no sense." 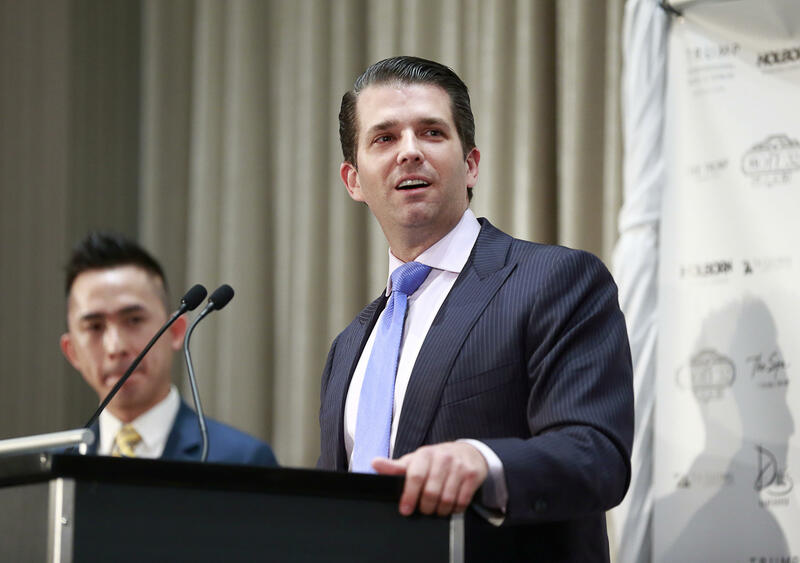 Trump Jr. added that Veselnitskaya then changed the subject to Russian adoption and it "became clear to me that this was the true agenda all along and that the claims of potentially helpful information were a pretext for the meeting." Later Tuesday morning, Trump Jr. released the email chain that set up the meeting with Veselnitskaya, and the original email, dated June 3, 2016, said, "The Crown prosecutor of Russia met with his father Aras this morning and in their meeting offered to provide the Trump campaign with some official documents and information that would incriminate Hillary and her dealings with Russia and would be very useful to your father." That email went on to say, "This is obviously very high level and sensitive information but is part of Russia and its government's support for Mr. Trump." "Aras" is Aras Agalarov, the Russian billionaire who brought the Miss Universe beauty pageant - owned by Donald Trump - to Moscow in 2013. The email was written by Rob Goldstone, the publicist for Agalarov's son, Emin, who asked Goldstone to offer Trump Jr. the meeting.